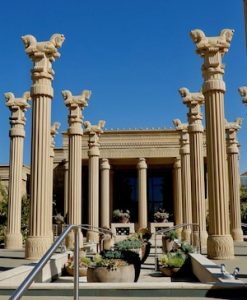 I recently visited Darioush Winery located in Southern Napa Valley. 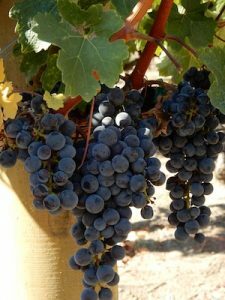 With its picturesque hills, 400+ wineries, and temperate climate, Napa Valley is one of the world’s premier wine-producing regions. Every year 3-million people flock to this region to bike, hike, eat delicious cuisine, and enjoy some of the world’s most excellent wines. Darioush Winery immediately captures your attention and imagination with its stunning, unique architecture, and landscaping. Lily ponds with bubbling fountains and palatial, double bull topped stone columns flank wide steps to the visitor center and are reminiscent of royalty and architecture of an era long past. This striking architecture was designed to resemble the ruins of Persepolis in ancient Persia, an homage to founder, Darioush Khaledi’s heritage. Upon arrival, I was warmly greeted with a complimentary glass of wine while soaking in the beauty of my surroundings. Gracious hospitality is rooted in the essence of Darioush Winery and the wine tasting experience. Visitors may make reservations for bar side, tableside, or outdoor seating. I chose to be seated in a private tableside seating area on comfortable sofas in the elegantly designed visitor center. My wine sommelier served each wine, explaining its origin and composition, and allowed me to enjoy and delightfully savor each one in an intimate, relaxed atmosphere. Darioush is committed to the Bordeaux-style of winemaking and the wines fully embraced this philosophy. Each wine I tasted was aromatic, complex, and delightful. My wine flight included Viognier, Merlot, Shiraz, Pinot Noir, and Cabernet Sauvignon. I couldn’t resist buying a few bottles to take home. Darioush Khaledi emigrated from Iran to the U.S. in 1976 seeking opportunity and freedom. He founded a family-owned grocery chain that was once the largest family-owned business of its kind in California. He developed an interest in wine at an early age, influenced by his father’s winemaking and cultural influence of winemaking in Shiraz. 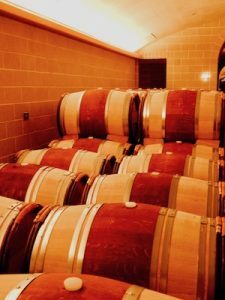 Darioush attained his American dream when he and his wife, Shahpar, founded the winery in 1997 and their first vintage produced 400 cases of wine. “Show your dreams to others” is a Persian proverb and Mr. Khaledi has undoubtedly succeeded in this regard. His is indeed an inspirational story of achieving the American dream. Darioush Winery was not a destination, but an unforgettable experience filled with excellent hospitality and fine wines in an elegant setting. Schedule a portfolio tasting by visiting Darioush.com or calling 707-257-2345. The winery is located at 4240 Silverado Trail, Napa, California and is open from 10:30 a.m. to 5:00 p.m. daily.